To add some interest to the design of an otherwise relatively plain dress, I decided to add a small puff to the top of my long, straight sleeves. Not only that, but I wanted to ruch the puff to give it even more texture and dimension. I wanted to use existing patterns for long sleeves and puffed sleeves– the problem was, my sleeve patterns are completely different shapes. As in, my puffed sleeve pattern is symmetrical and my long sleeve pattern is cut so that the seam is set towards the back. I decided that rather than try to convert my puffed sleeve pattern, I would use it anyway and rely on the fact that the whole thing is going to be too short for the difference in seam placement to matter. Let me just say at the outset that I am never going to make a dress out of pashmina shawls again. The fabric is so loosely woven that it’s next to impossible to cut straight, it frays if you look at it funny (I had to zig-zag every single edge to keep it from unraveling entirely), and it snags at the slightest provocation. Unpicking seams takes forever and leaves gaping wounds in the fabric, the weight of the skirt alone appears to be pulling the fabric itself out of shape, and I have no idea how I’ll wash this thing if it ever needs cleaning. Never again. Never. Again. It’s no secret that I enjoy making elaborate Halloween costumes. But the first Halloween with our baby daughter, to my surprise, my husband agreed right off the bat to my first idea for a family costume– Mary Poppins and Bert, with the baby as one of the dancing penguins in the Jolly Holiday animated scene. So the outfit is finished at last! Here I’m wearing it over a modern sleeveless cotton blouse that passes as a corset cover, and an antique Edwardian petticoat. (I’d planned to wear a corset but ditched it at the last minute because I thought it would be uncomfortable to wear while sitting on the ground) I accessorized with my Edwardian pumps, my bow-bedecked hat, and a paper parasol. Here are some shots of the full outfit! Channeling my inner Lady Mary… I’m totally judging whatever it is I’m looking at off in the distance. With the family, including my little girl in her white eyelet dress! As I’ve said before, I always do appreciate when a dress turns out exactly as I’d pictured it. It doesn’t always turn out that way, which is sometimes a good thing, but there’s just something so satisfying about comparing the sketch to the real thing and seeing it come to life. Every now and then I feel the need to rope my family into my historical costuming hobby… but it’s easier said than done. Men’s outfits are relatively straightforward, but getting a 6-year-old to dress up in something she doesn’t want to wear can be tough– and even if you can manage it, watching her go through her day blithely unaware of the various grass stains and other horrors she’s inflicting on your carefully-chosen outfit is just painful. For that reason, I’ve refrained from ever trying to put my daughter in any genuine antiques, or even things that I’ve made with complicated techniques or particularly nice fabrics. I just know she’ll spoil them and I don’t want to spend my day worrying about it instead of enjoying the event. But what to do when you’re just dying to attend something as a family, in full get-up? You improvise. 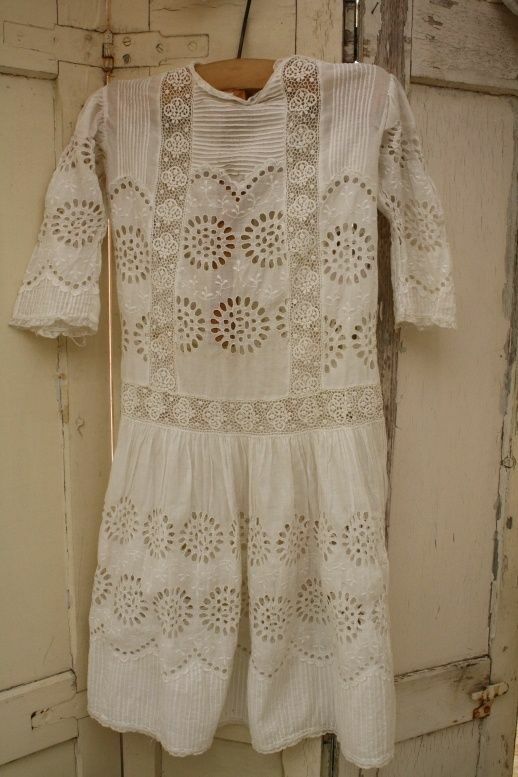 Since I spent some time making a light and airy Edwardian picnic dress for myself, I figured that something similar was in order for the kid. While I’d love to make her a dress laden with hand-embroidery and antique insertion lace, as I mentioned before it’s just not in the cards right now– luckily, many extant dresses rely heavily on pre-embroidered fabric for decoration, which is still widely available, so I decided to go that route. After the dress was structurally finished and the main embellishments were attached, I still had a few more things to do to finish it off. First I made a belt, as it was necessary to cover up the closure at the waistband. I’d originally considered incorporating it into the dress itself, but ultimately decided that I’d rather have a little more flexibility in sizing, so a separate belt that could be cinched in or loosened a bit was preferable. To make the belt, I cut a long rectangle of fabric and machine-sewed a bunch of 3/8″ tucks into it. I stitched the tucked piece to a flat band of fabric, right sides together, then turned and pressed it flat. I considered finding a sash buckle or pin to close it, but ultimately decided that it would be an unnecessary focal point on the dress when I really wanted the focus to be on the embroidery. Instead I closed the belt in back with snaps, though I left enough overlap to use a buckle later if I wanted to. Next up were covered buttons, which seemed to be a popular decorative accent in the period. I bought 5/8″ covered button kits and covered them in a double layer of peach lawn– the second layer was necessary because otherwise the shiny metal button base showed through the sheer fabric, though I will note that even with very thin fabric, the extra layer made it difficult to snap the button-back into place. I stitched them to the dress in sets of three. They’re not functional, but I think they added an extra-Edwardian touch to the outfit, even if my fingertips were killing me by the time I’d covered all 18 buttons. Remember the lace I put on the sleeves while I was stitching up the bodice? Well, once I’d added the embroidered appliqués I realized that the lace was too white in comparison to the warm ivory tint of the organdy. I unpicked my hand-stitching and soaked some new lace in strongly-brewed jasmine tea to give it just a bit more of an aged look. I’ve discovered that black tea gives far too much of an orange tint to lace, and the organdy was more yellowish than anything, so jasmine tea was the perfect brew to use for this. I soaked the lace for ten minutes and then let it dry completely before giving it a rinse in cold water and letting it dry again. That gave it just enough of an off-white shade to keep the difference between it and the appliqués from being glaringly obvious. Then I stitched the lace back into place on the sleeves, and added more of it between the tucks at the hem of the underskirt to tie the whole thing together. I decided this time around to just stitch it so it showed evenly over the edges of the tucks instead of undulating in and out of sight. It’s just easier, and it looks better on the skirt that way, so I changed the sleeves to stay consistent. So the dress is finished! Stay tuned for final pictures!